Many moons ago, a tradition was born for Rockboxers and friends alike. When a small group of these beings (scientific name: Rockboxus hackerus) gathered together, they would build unusual structures with their DAPs. These structures became known as "Tower of Rockbox". Here on this page, Rockboxers the world over may post pictures of their Towers they built at gatherings, or with a large collection of supported players, both intact or opened up. With that, begin the ritual construction! To prove that the tradition has been along us already from the start, check out this picture from April 2002 featuring Linus and Björn and a bunch of Archoses. This risky construction was made of: 2 Cowon X5s, 2 Archos Recorders, 2 Archos FM-Recorders, 3 Ipod Videos, 1 Ipod Nano, 3 Iriver H100s, 2 Iriver H300s (one a "development version") + 1 H300 main board, 1 Gigabeat F, 1 Sandisk E200 + the Sandisk E200 devboard and some random boards that were lying around. 2 Archos JBRv1s, 5 Gigabeat Fs, 7 Gigabeat F mainboards, 1 Gigabeat X, 1 Gigabeat S, 1 Gigabeat S mainboard, 1 Gigabeat V, 1 iPod Color/photo, 3 iPod nanos, 2 iPod videos, 1 iriver H100, and 3 Sansa e200 series. Finally, involved in its construction were scorche, Llorean, lostlogic, soap, hcs, toffe82, and Joely.. 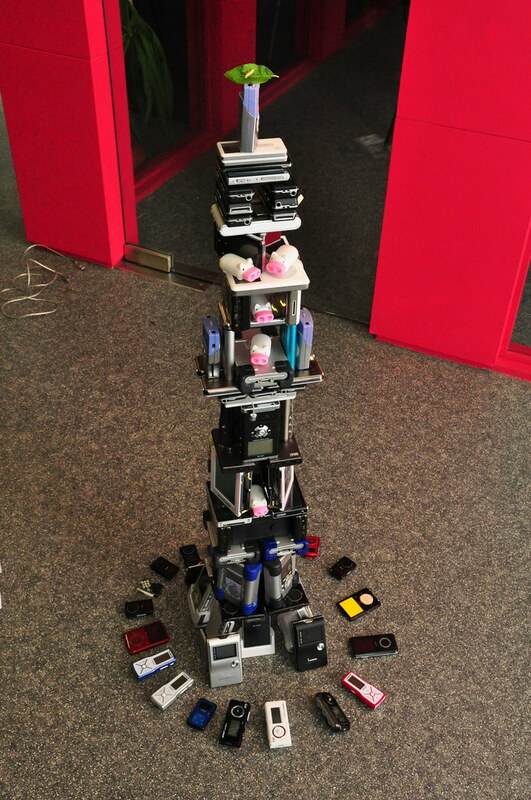 This Tower of Rockbox was built when markun visited New York City on 10 Oct, 2007. We used Marcoen's Gigabeat F, my iPod video (5.5G 30GB) and Archos JBRv1, and an H320 and H120 from two of my friends who were there with us. -- Posted by LambdaCalculus379 on 30 Nov, 2007 at 20:45. This Tower was built using an H140, H360 (H340 modified), an Archos JBRv1, 3 Gigabeat Fs (2 40 and 1 20), an H120 (with RTC), and a 5.5G iPod video 30GB. Involved in its construction were markun, LambdaCalculus379, Davide-NYC, and evilnick. Made while I was at work today. I used my 5.5G iPod video, Archos JBRv1, Sansa c240, and (new... sorta) 4G iPod color. Video of the build to come! Here it is, folks... the biggest, baddest Tower of Rockbox constructed at DevConEuro2008! Try and guess all of the players used in its construction! 75cm! Apologies for the grain quality; all we had was a cell phone camera with limited quality. Anyway, this Tower was constructed by LambdaCalculus379 and wpyh at a pub in Hoboken, New Jersey. What better way to enjoy Rockbox than with a tall glass of Guinness? Once again, markun visited New York City, and together with LambdaCalculus379, Davide-NYC, and evilnick, constructed this lovely Tower of Rockbox at our favorite Irish pub, Puck Fair, in New York City. This Tower was built with an Archos Jukebox 5000, an Archos JBRv1, a bunch of iriver H100s, three Gigabeasts, three Gigabeat F's, two iPod videos, an iPod color, a 2nd gen iPod, an iAudio X5L, a Sansa e200, a Sansa c200, a Meizu M6SP, and an H300. I may have missed one or two players, but you should be able to spot them. You can also spot a couple of the beers evilnick was enjoying that night over in the back. Built by scorche, toffe82, and soap during SCaLE7x in Los Angeles, California. Try and guess the players used in its construction. And you thought 2008's Tower of Rockbox couldn't be topped... well, it's been topped... with LED pigs. 1.04m tall, highest tower so far! Includes an HTC Magic in honour of Rockbox being ported to Android! 117cm, The highest tower ever, and the first DevCon tower to have RaaA devices.